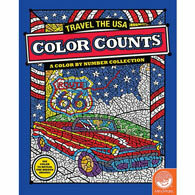 You can count on pages of creativity with these fun and challenging color by number books. Hidden images reveal themselves as the numbered designs are colored in, while the unnumbered designs encourage you to create your own masterpieces. Each book has 23 perforated pages; 8 fold-out pages that extend to 10" x 15". Ages 6+.